Seattle Baroque Orchestra will perform the world premiere of Aaron Grad’s “Strange Seasons,” a concerto featuring his hand-built, one-of-a-kind electric theorbo and that is an ode to Puget Sound’s weather. Stories of falling head over heels for an instrument are not unusual. What is unusual is love at first sight — or sound — when that instrument is the theorbo. In fact, it was the combination of both the theorbo’s looks and sonority that won over Seattle-based composer Aaron Grad. Along with music by French Baroque composers, Seattle Baroque Orchestra performs Aaron Grad’s new concerto for electric theorbo, with soloist John Lenti and narrator Jeff Renner. 7:30 p.m. Nov. 11, Benaroya Hall; $20-$40 (206-325-7066 or earlymusicseattle.org). Seattle Baroque Orchestra will perform the world premiere of Aaron Grad’s “Strange Seasons,” a new concerto for electric theorbo and an ode to Puget Sound’s weather, Nov. 11 at Benaroya Hall, with John Lenti as the soloist. For “Strange Seasons,” Grad penned his own poetry: an elegantly crafted sonnet for each of the four parts. He even consulted with former KING-TV meteorologist Jeff Renner to make sure that his poetic imagery squared with scientific accuracy. Renner will be on hand during the concert to recite Grad’s sonnets. Grad wrote his concerto in four sections, each relating to a different season. But the model he found in Vivaldi’s “Four Seasons” was not musical: it was literary. Each of the concertos in the Italian composer’s beloved cycle is prefaced by a sonnet that likewise addresses seasonal associations. Early Music Seattle, Seattle Baroque Orchestra’s parent organization, has never before presented the world premiere of a newly commissioned work. But Music Director Alexander Weimann says the “Strange Seasons” project fits into ways of thinking about music that are second nature to early-music aficionados. The largest and most deep-voiced member of the lute family, the theorbo burst on the scene in Italy in the late 16th century — around the time the new art form of opera was being invented, for which it proved to be superbly well-adapted for expressive accompaniment. Nowadays, the theorbo is typically encountered in early-music performances of compositions from the Renaissance and Baroque eras. While he was an undergrad at New York University studying jazz guitar, Grad, now 37, caught a performance of Monteverdi’s “L’Orfeo,” one of the very first operas ever written. He was struck by similarities between the role of accompaniment instruments in early music and the way jazz bands wrap around a singer’s delivery. 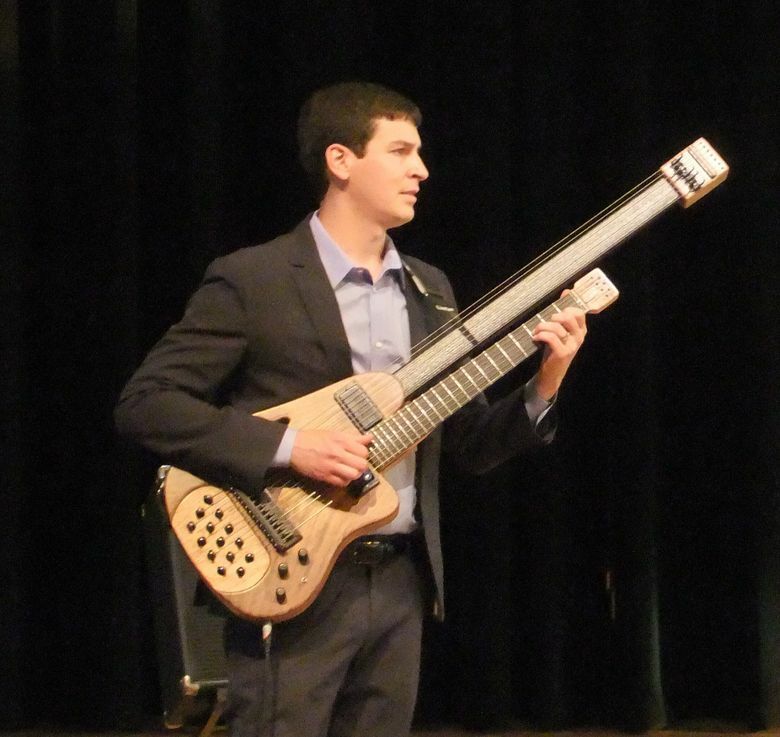 Grad came up with the idea of building his own electrified version of the theorbo that would preserve its solid-body foundation and fretting. He launched a Kickstarter campaign and spent nine months in his garage engineering his contemporary hybrid. Completed in 2012, it was soon put to the test when Grad fulfilled a commission for a concert-length song cycle: “Old-Fashioned Love Songs,” which both presented his new instrument to the public and served as a musical love letter to his wife. Radical as Grad’s introduction of the electric theorbo was, “Love Songs” used the instrument in a traditional way, to provide accompaniment for voice. But his new concerto makes another leap by turning the spotlight on the theorbo as the protagonist, here accompanied by a chamber orchestra of strings and harpsichord. Thomas May writes about the arts for many publications. His books include “Decoding Wagner” and “The John Adams Reader” and he blogs at www.memeteria.com. On Twitter @memeteria.